The best way to find out what style of beer/ale you like is to try them. This seems obvious but it is so easy to fall into patterns of buying what we know. Here are some different beers that are relatively easy to find and have completely different signatures. Blanche de Chambly: This is a great example of a Belgium style white from Unibroue and is very clean and refreshing. I recommend this for everyone and you can find it at any grocery store that has a decent beer selection. 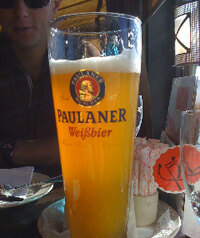 Paulaner Hefeweizen: A classic German wheat beer with banana and clove subtly woven throughout this tasty brew. American’s usually put a slice of lemon in their Hefe’s, but I would suggest against this and drink it as the Germans do, just the beer, no lemons or anything else. Sapporo Reserve: Not as easy to find as the regular Sapporo, but worth looking for. Classic Japanese lager that is very drinkable and comes in 22oz cans for a reasonable price. If you can’t find the reserve go for the regular Sapporo. Young’s Double Chocolate Stout: This is a staple in my fridge, a delicious chocolate and malt stout that will blow your mind. Try and find the can with the nitrogen widget not the bottle. Duvel: Belgium strong ale that you can find almost anywhere. Spicy, malty and hints of hops and citrus. Taste it and you will understand. Actually had some Sapporo Reserve in Boston at the Samurai Eatery! Made a great addition to some good sushi.